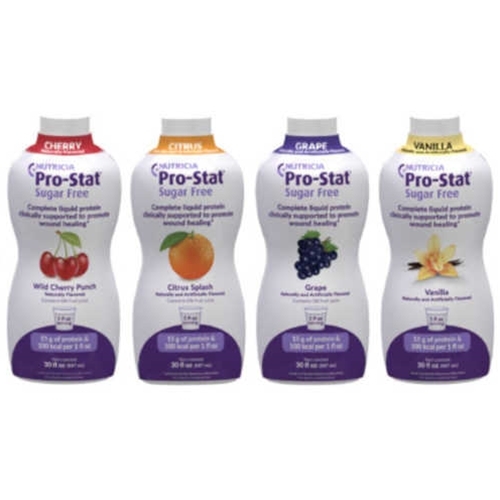 ProStat Sugar Free from HealthyKin.com is medical food intended for the dietary management for persons with wound/pressure ulcers, at risk for pressure ulcers, PEM, unintentional weight loss, or have low serum protein levels. Hydrolyzed Collagen Protein, Water, Glycerin, Malic Acid. Contains 2% or less: Natural Flavors, Potassium Sorbate (to help protect flavor), Sodium Benzoate (to help protect flavor), Sucralose, L-Tryptophan, Phosphoric Acid. great product, great in fruit smoothies with a plus with the great favors the company has available. Healthy Kin, had super fast shipping and I love that. I will continue to come back. Great source of pure protein without any extra junk. It's hydrolyzed so it won't bother your stomach & the body absorbs it easily. This is an easy-to-take protein that helps heal your body without extra sugar. Great product, got it for my elderly father. He needs it for wound care and was low in protein and it was recommended from a hospital dietician. He'll be on it for good. Great product sold by an awesome company. Swift delivery with prompt service!!! This stuff might provide protein, but it stinks! Also, tastes terrible.